The devastating effects the meat and dairy industry have on our planet are often overlooked. For example, raising animals for food requires enormous amounts of resources like water, food, land, and energy. Livestock and their byproducts account for 32,000 million tons of carbon dioxide per year (51 percent of all worldwide greenhouse gas emissions). Although choosing a vegan or vegetarian diet is clearly the best option, not only because of health reasons, but because it would entirely cut all animal products out of your life, is not realistic for everybody. However, eating meat-less might be an option. Compromising and cutting meat and dairy out of your diet, even for a day or two, is by far the most significant lifestyle change you can make, so give it a chance! We now also have lots of meat substitutions, so the change doesn’t have to be so drastic. This is a great way to not only support local farmers and the economy, but also to significantly cut down the miles your food will have to travel, thus cutting down on fuel and excessing packaging as well. This will also mean your food will be fresher and you won’t be supporting huge companies that are often incredibly wasteful. So, consider taking a trip to the farmers market at Botanical Gardens which is open every Saturday from 8am to 1pm, or the Home Farm Market at Wadson’s Farm in Southampton, open Tuesday to Saturdays, before buying that same product at a supermarket. During 2018 the no-straw movement really took off, and for a good reason. Did you know that plastic straws are too lightweight to be recycled in most places? Yes, and as of January 2019, they are the eight most-found ocean trash in cleanups, having a very negative impact on ocean wildlife. We get it, they are fun and a great tool for people with disabilities, but you don’t have to ditch them altogether. You can find reusable straws made out of steel or glass at affordable prices at Naked Zero, The Chef Shop and Brown & Co, to name a few stores. Just ask for no straw the next time you’re ordering ice coffee or a fountain drink, and carry a reusable one instead everywhere you go. Most likely, there is a plastic bag filled with more plastic bags somewhere in your kitchen right now, and you’re not the only one. According to the Center for Biological Diversity, plastic bags are used for an average of 12 minutes, which is pretty wasteful considering how many resources are needed in order to manufacture them (It takes the same amount of the gas required to drive one mile, to produce 14 plastic bags). Paper bags are not a sustainable option either, it takes 13 percent more energy to make a single paper bag than to make two plastic bags, and because they are heavier than plastic bags, more fuel is required in order to ship them. 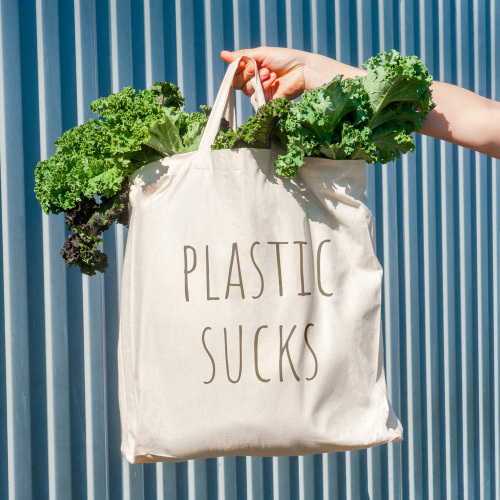 So, shop without the guilt and carry reusable shopping bags wherever you go! You can find them at pretty much every store, they are super affordable and can fold small enough to be able to have them on the go. Globally, humans buy a million plastic bottlesa minute and that number is expected to increase by 2020. So where does all that plastic go? Plastic is not recycled in Bermuda, so it is only used once and then discarded, or finding it’s way into our ocean, and because plastic takes around 400 years to naturally decompose, every single plastic item we have used in our lifetime will still be here long after we are gone. When you take a second to consider how much plastic you use in a day or in a week, and then multiply that by the billions of people on the planet, it’s easy to see why this is such a big issue. During the 2018 throne speech, the government of Bermuda committed to eliminate single-use plastics by 2022, and to educate the community on recycling and reusable-items, so why not make the switch a little earlier? Even if you only buy one bottle of water a day, you are still wasting over three hundred single-use bottles a year alone. You can reduce your environmental footprint significantly by simply ditching single-use plastic bottles and switching to a reusable one instead. Not to mention you will save money in the long run so it’s a win-win. It is too late to look the other way when it comes to your eating decisions. Taking baby steps to live sustainably can be easy and accessible to everybody if we give it a chance, so why not do just that?